The drivers have arrived and the teams are set up. 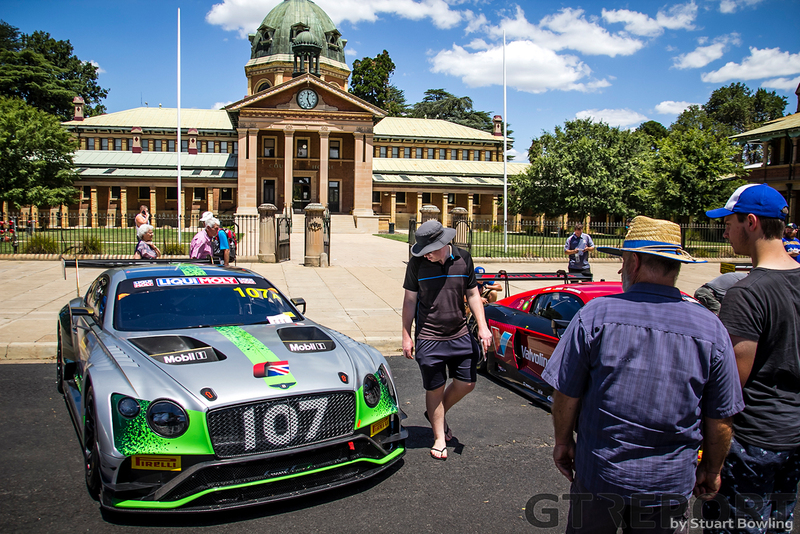 On Thursdays the Bathurst 12 Hour got underway with track action for the support series and a Town to Track parade for the stars and cars of the Bathurst 12 Hour. 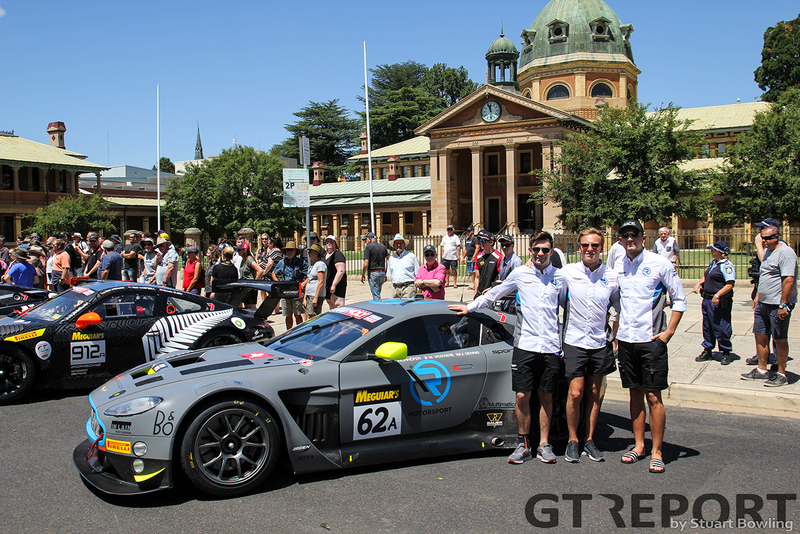 We took a stroll through pit lane and followed the race cars downtown Bathurst to find out what’s new. 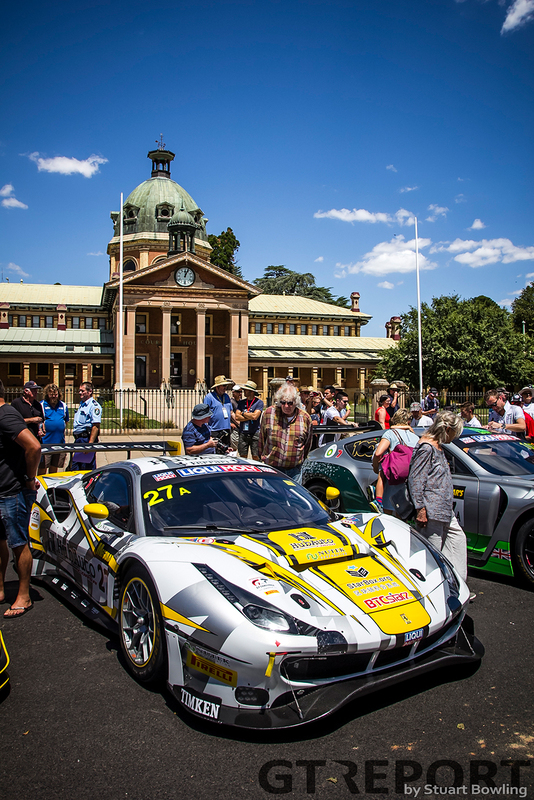 ➤ One car from each GT3 manufacturer as well as a sole MARC Car took place in Thursday’s Town to Track parade, completing a lap of Mount Panorama before driving into the city centre for the pre-event photo with fans able to soak up the atmosphere in a similar fashion to the Spa 24 Hours. ➤ Bentley Team M-Sport unveiled a fresh look on their Bentley Continental GT3s, with green splashes, hints of gold and a number 100 sticker behind the windows on both cars to celebrate the British brand’s centennial year. In the name of originality, the guys and girls from Crewe in England gave the first look to fans trackside attending the Town to Track parade on Thursday, with the scheme not breaking cover until that point. 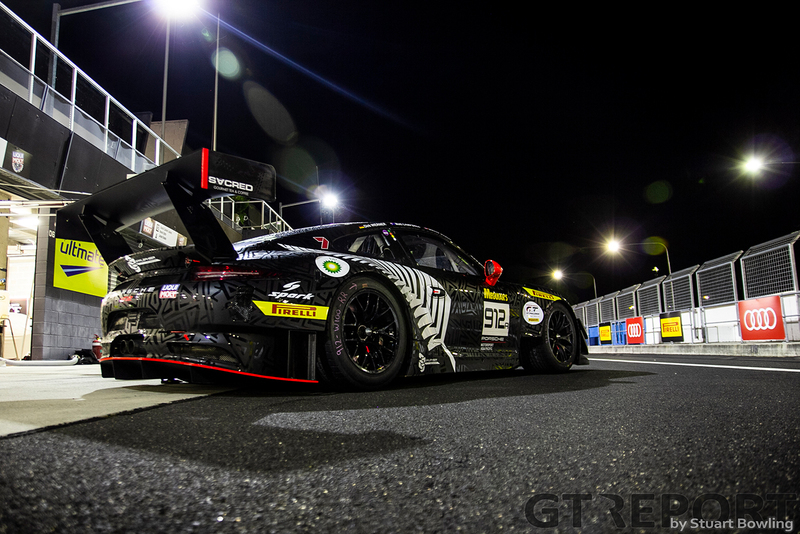 ➤ A number of cars were still being wrapped in their warpaint on Wednesday afternoon, including Craft-Bamboo Racing’s Mercedes-AMG GT3 and the Earl Bamber Motorsport Porsches in their resplendent Kiwi liveries. All cars, however, will be ready for the first practice session on Friday morning. ➤ R-Motorsport have one of the most impressive garage set-ups in pit lane, while Bentley Team M-Sport and both the BMW Motorsport set-ups are a force to be reckoned with. Speaking of R-Motorsport, the team’s pair of Aston Martins are being prepared by Jota Sport and Arden. ➤ We’ve also lost a Ginetta Australia entry, with the number 56 car being withdrawn. It leaves one Ginetta entry, the number 55 G55 in Class C/GT4 which will be piloted by Brad Schumacher, Jimmy Vernon and Karl Reindler. ➤ Walkenhorst Motorsport and BMW Team Schnitzer populate the top end of pit lane at pit exit, while KCMG and MARC Cars Australia are at the lower end with everyone else in-between. 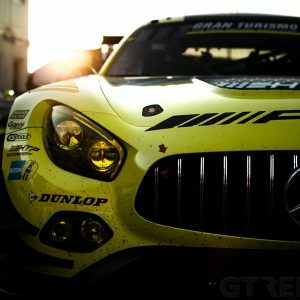 ➤ Mercedes-AMG Team GruppeM Racing have a spare AMG GT3 in the paddock this weekend. The team is fielding Maximilian Buhk, Raffaele Marciello and Maximilian Götz in their bright yellow Mann-Filter-sponsored car. ➤ A late change to the FIA driver ratings has forced Ryan Millier out of the Trofeo Motorsport Lamborghini Huracán GT3. Now a silver-rated driver, the Australian will be replaced by Blancpain GT Series Asia runner-up in the Am championship Ben Porter. Porter, a bronze-rated pilot, joins team-boss Jim Manolios, Ivan Capelli and Dean Canto for the team’s Pro-Am assault. Millier will still be part of the team, working the squad’s strategy from the pits. ➤ Another last-minute change has taken place over at the SunEnergy1 Racing/Erebus Motorsport Mercedes-AMG GT3 garage where Austrian ace Dominik Baumann has replaced Tristan Vautier. The Mercedes-AMG GT3 expert joins Bronze driver Kenny Habul and Thomas Jäger in the flame-licked number 75. 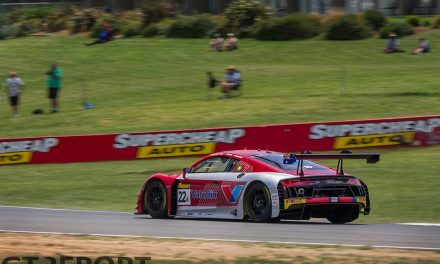 ➤ Walkenhorst Motorsport arrives at Bathurst 12 Hours for its second attempt at the Australian classic, after failing to start the 2017 edition. Two years ago, the BMW Juniors-driven BMW M6 GT3 suffered a weekend-ending accident in practise. Despite, the crew carried on to support brand compatriots Steven Richards Motorsport during the remainder of the weekend. Since then they’ve gone on to win the 2018 Spa 24 Hours with Christian Krognes. ➤ Two Porsche 991 GT3Rs are entered under the Earl Bamber Motorsport moniker supported by Porsche Motorsport Asia Pacific and Manthey Racing. This marks brothers Will and Earl Bamber’s first race as team-owners in GT3, having previously competed with Porsche Cup cars in Asia. 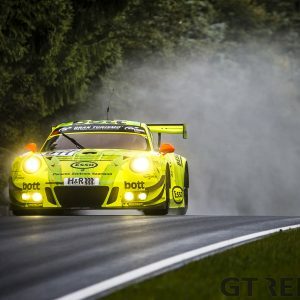 The team’s namesake, however, won’t be driving, instead opting for Matt Campbell, Dirk Werner and Dennis Olsen in the number 911, and Sven Müller, Mathieu Jaminet and Romain Dumas in the number 912. Both cars leave no room for speculation about the Bambers’ nationality, sporting two stunning all black, silver fern-adorned liveries. ➤ Teams in Class A/GT3 will race on the new Pirelli P Zero DHD2 control tyres, first introduced in the European and Asian Blancpain GT championships last year and adopted by Australian GT for 2019. The DHD2 compound replaces the DHC tyres, with the DHD2 rubber slated to be faster, quicker up to speed and more ‘drivable’ with a wider usage window. 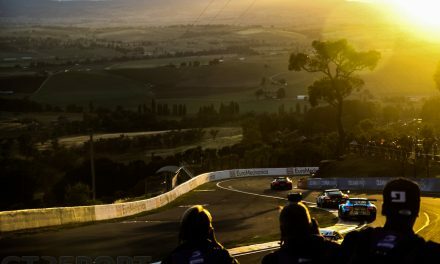 ➤ No less than 23 drivers made the journey the past few days from the 24 Hours of Daytona in the United States to compete in the Bathurst 12 Hour. All six drivers of Earl Bamber Motorsport are fresh off the 24 Hours of Daytona: While Mathieu Jaminet and Sven Müller raced in respectively the works Porsche 991 RSR and NGT Motorsport Porsche 991 GT3R, their number 911 Porsche 991 GT3R co-pilot Romain Dumas competed with CORE Autosport in the Nissan Onroak DPi. GTD-class competitors Dirk Werner, Dennis Olsen and Matt Campbell join in the number 912 sister car. Earl Bamber shared the works Porsche with Jaminet at Daytona, but he won’t be behind the wheel at Bathurst. Jeroen Bleekemolen switches from Mercedes-AMG to Porsche this weekend, joining Tim Pappas and his Black Swan Racing Porsche team who also raced in Daytona. Paul Dalla Lana is also taking his own team with him: the Canadian brings co-drivers Mathias Lauda and Pedro Lamy and the Spirit of Race Ferrari 488 GT3 squad along with him to Bathurst. GTLM winner and BMW works driver Augusto Farfus is the only winner from last weekend’s 24 Hours making the trip Down Under. Daytona pole-winner and lap-record breaker Oliver Jarvis switches from the Mazda Team Joest DPi to the KCMG Nissan GT-R NISMO GT3. Other drivers who take on both races are: Luca Stolz, Dominik Baumann, Christina Nielsen, Maximilian Buhk, Christopher Haase, Christopher Mies, Markus Winkelhock, Kelvin van der Linde, Fred Vervisch and Chaz Mostert. ➤ 40 cars are entered for this year’s Bathurst 12 Hour. This is a drop of 13 from 2018. However, Class A/GT3 remains at 28 cars with an arguably stronger field than ever before. ➤ None of last year’s winners are back to defend their title. 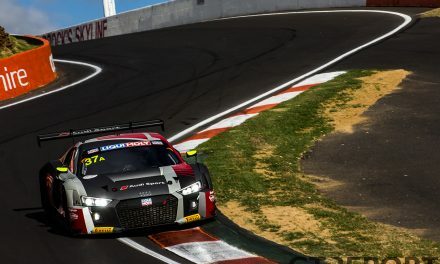 WRT wasn’t able to put together a program that included the Bathurst 12 Hour, leaving its regular drivers Robin Frijns, Dries Vanthoor and Stuart Leonard sidelined as well. ➤ 8 former winners who did make it are Triple Eight trio Craig Lowndes (2014, 2017), Jamie Whincup (2017) and Shane van Gisbergen (2016), KCMG Nissan pilot Katsumasa Chiyo (2015), Erebus driver Thomas Jäger (2013), Audi Sport Team Valvoline works driver Christopher Mies (2011, 2012) and the only pre-GT3 era winner still in the race, MARC Cars Mustang II racer Paul Morris (2007, 2010). Erebus Motorsport is the only former winner amongst the teams in the field. The Betty Klimenko-owned team won back in 2013 with Thomas Jäger driving. ➤ South-east Australia has been suffering an endlessly hot summer. Temperatures for weeks have been well above 30 degrees Celsius, at some parts of New South Wales even reaching the mid-40s. Friday will see a break in the heatwave when the temperature is forecast to drop to 27 degrees before rising again through the weekend to reach 32 degrees on race day. The weekend will be mostly sunny, but thunderstorms might interrupt Saturday afternoon’s proceedings. Forecast courtesy of Racecast Weather. ➤ Nissan was the last manufacturer to announce its entry in the Bathurst 12 Hour, but aren’t sitting back: the Japanese brand this week announced it is entering the full Intercontinental GT Challenge season. Hong Kong-based KCMG continues to fly the Nissan flag at Laguna Seca, Spa, Suzuka and Kyalami. ➤ Ferrari and Honda have also confirmed their participation in the Intercontinental GT Challenge, bringing the total number of manufacturers in the unofficial GT3 world championship to eight. While the Italians are represented in Bathurst by HubAuto Corsa and Spirit of Race/AF Corse, Honda has elected to skip Bathurst and join the championship from Laguna Seca onward with its 2019-spec NSX GT3 Evo. ➤ BMW Team Schnitzer has reunited with Augusto Farfus with whom it won last year’s FIA GT World Cup. Farfus took another important victory last weekend when he won the GTLM class at Daytona. The German team honours its long-time team principle Charly Lamm who unexpectedly passed away last week at the age of 63 with a big ‘Thank you, Charly!’ on the hood of the BMW. ➤ Former World Champion Mark Webber will light up the track on Friday and Saturday with demo laps of the brand-new Porsche 911 GT2 RS Clubsport. The 515 kW/700 hp strong beast, first spotted by GT REPORT testing in Monza, is expected to make its competition debut in SRO’s new GT2 category later this year. 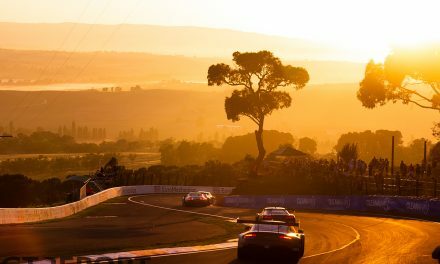 ➤ You can easily keep track of the Bathurst 12 Hour on our dedicated event page where you will find the latest news, a look back at 2018, the complete entry list, time schedule, interviews, history and everything else you need to know about the race and the Intercontinental GT Challenge. 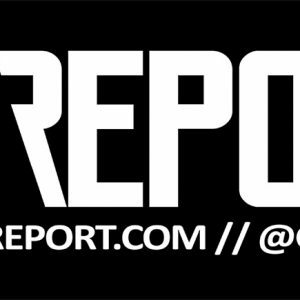 Additional reporting by Slade Perrins.